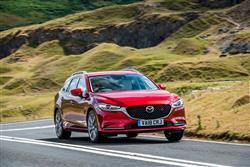 The fourth generation Mazda6 has built on the strong showing of its predecessor with sharper styling, better attention to quality and some very economical engines. Many will want it in this stylish Tourer estate guise. It's got the talent to give some better-selling cars in its class quite a lot to think about. 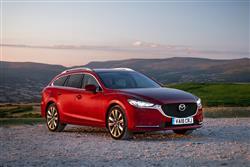 The Mazda6 hasn't had the easiest ride, whether the variant in question is a saloon or this Tourer estate. The first generation car drove brilliantly but felt a bit lightweight and the diesel engines were plagued with reliability issues. The second generation model was an improvement in virtually every regard but seemed to lack its predecessor's personality and fun factor. Some of that returned with the third generation model, launched in 2012. This featured Mazda's clever 'SYYACTIV' technology which dramatically improved running costs and made this model not only good enough to prise customers away from mainstream rivals but even to make buyers of lower order German compact executive saloons think twice. It only needed a smarter cabin and a bit of extra technology, both things apparently delivered by this MK4 model. Let's check out what's on offer. 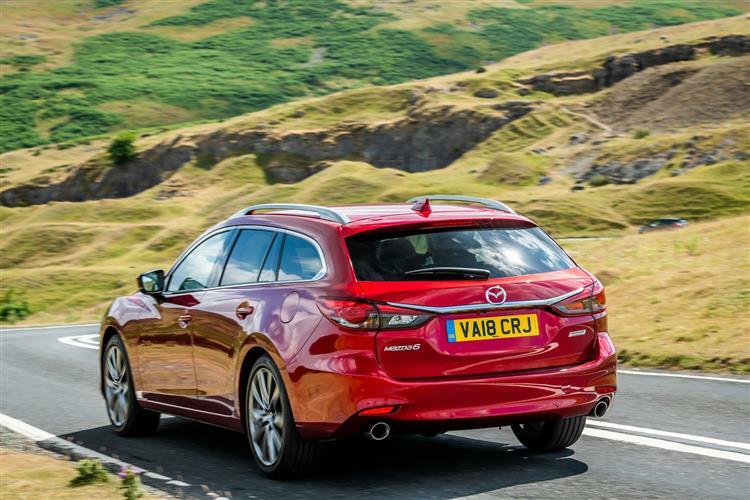 The Mazda6 Tourer sits on the same chassis that underpins the saloon variant, so the road going demeanour is just the same. 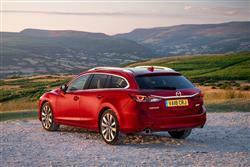 As before, most Tourer models will be sold with either 2.0-litre petrol or 2.2-litre diesel SKYACTIV powerplants. The 2.0-litre SKYACTIV-G petrol unit has been enhanced with redesigned intake ports, revised pistons and a more advanced fuel injection and cooling set-up. 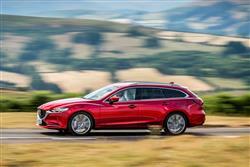 The alternative 2.2-litre SKYACTIV-D diesel puts out 150PS as before in its base form, but generates 184PS (up from 175PS) in its highest state of tune. 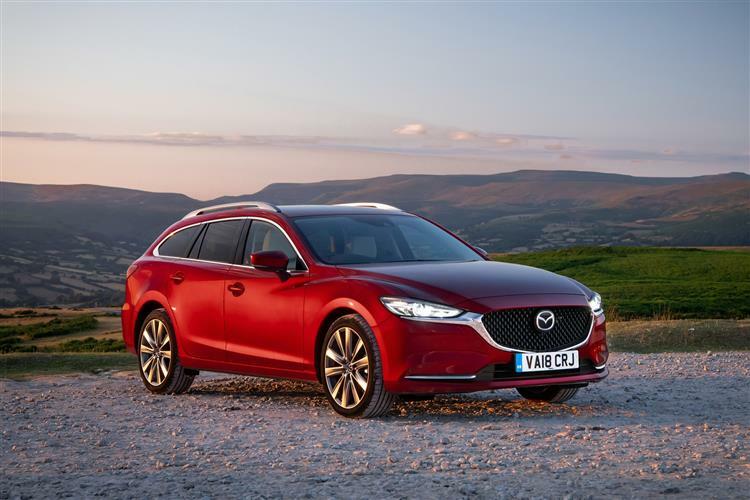 There is a completely new engine in the line-up, but it'll be a rare sight on our roads, a 2.5-litre petrol SKYACTIV-G unit borrowed from the US-market CX-9 SUV. 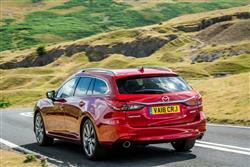 It's paired with a SKYACTIV-DRIVE six-speed automatic gearbox. Some effort has gone into improving ride comfort and handling dynamics too, the car benefitting from suspension fine tuning and component upgrades. Bump stop characteristics have been revised, the front dampers have increased in diameter and rebound springs have been added, all resulting in smoother vehicle behaviour and improved ride quality. In addition, the steering knuckles have been lowered to ensure a more precise response to subtle steering wheel actions. Extra noise insulation, improved aerodynamics and a special vibration-absorbing material been added to the centre tunnel and the roof lining should all improve refinement. 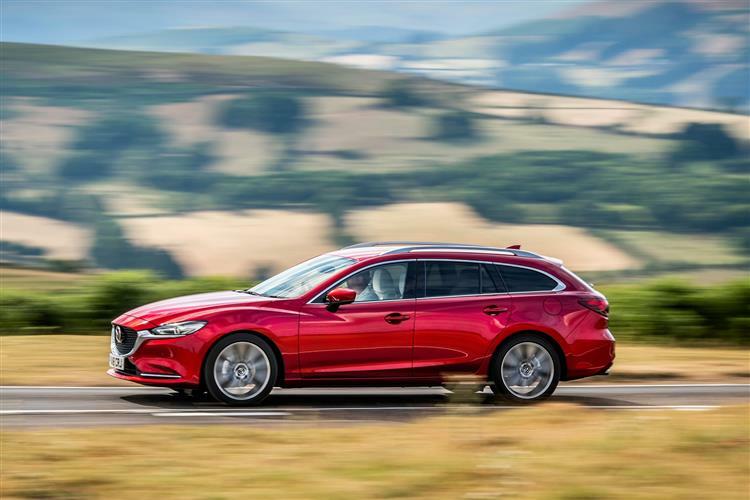 Not a lot really needed doing to the Mazda6 Tourer's styling, but Mazda has subtly changed it anyway for this fourth generation model. It's a mean and muscular looking thing; all pent-up curves and bulges, with beady eyes and a swooping, coupe-like roofline. The MK4 model update means a fresh frontal design focused around a smarter grille, which has the mesh positioned deeper within the surround to create what Mazda hopes is 'a more sophisticated and muscular face'. The revised LED headlamps integrate signature wing tips from the grille surround to underscore their so-called 'predator' style, and with the front fog lights now incorporated into the headlight cluster, the re-designed lower bumper features a sleeker profile and an aerodynamically efficient air intake. At the rear, this Tourer variant features cleaner rear bumper styling with more body coloured areas. Topping off the styling updates are smarter alloy wheel designs and the introduction of lustrous three-layer Soul Red Crystal paint. Step inside and the updates are even more evident. Higher quality materials and technology combined with refinements to the cabin design deliver more of an understated sense of luxury. There's now a larger eight-inch centre-dash display screen, plus a seven-inch TFT LCD positioned in the driver's instrument binnacle and the adoption of a full colour windscreen projecting a head-up 'Active Driving Display'. The dashboard and door trim designs have been redesigned, plus seat comfort has been improved. 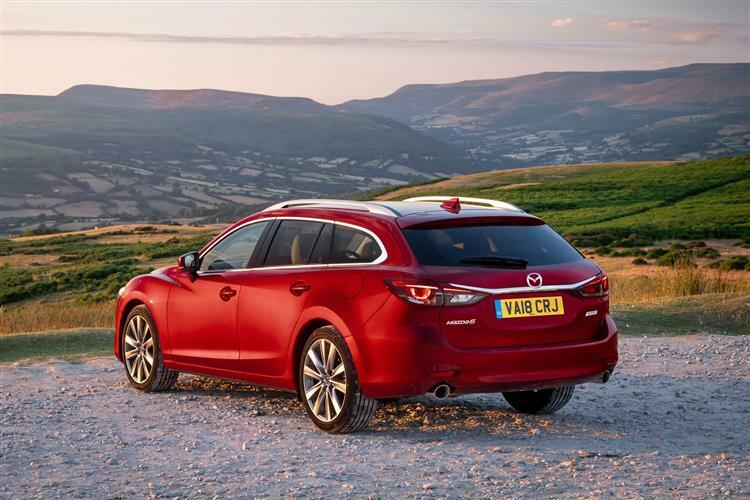 As before, the Tourer is acceptably practical, featuring a boot capacity of well over 500-litres with the seats up. Or, if you operate the clever flat-deck Karakuri rear seat folding system, there's well over 1,600-litres on offer. 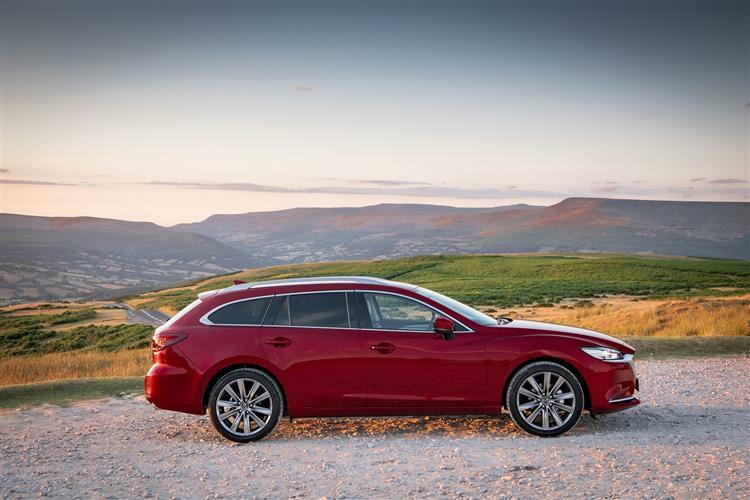 This Tourer estate requires a premium of around £930 over the equivalent four-door, which means that pricing sits mainly in the £24,000 to £33,000 bracket common to most Mondeo-class estate models. There are four trim levels: 'SE-L Nav+', 'SE-L LUX Nav+', 'Sport Nav+' and 'GT Sport Nav+'. There's a £1,400 premium to pay on the mainstream models if you want an auto gearbox. The top 2.5-litre petrol variant (which costs from around £31,500) is of course auto-only. 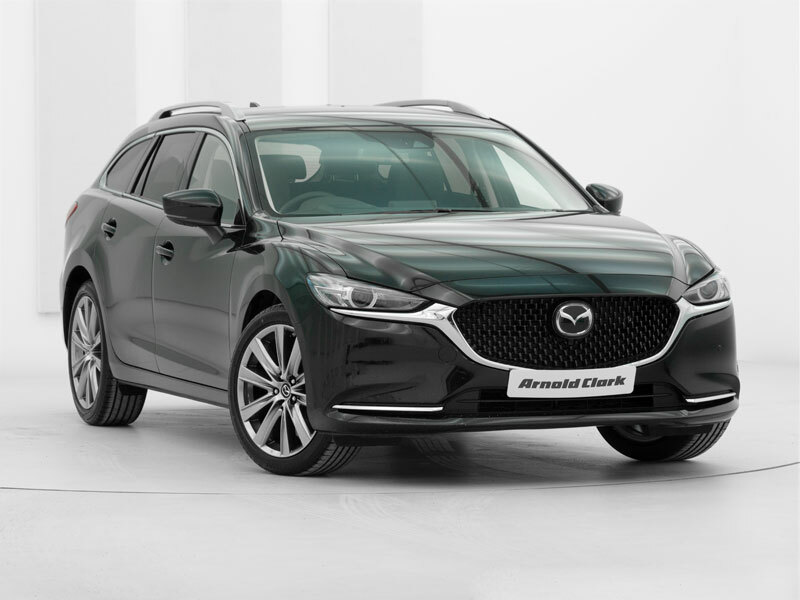 With an increase in standard active safety equipment across the range, all Tourer models now feature a huge range of advanced i-ACTIVESENSE technology, including Blind Spot Monitoring with rear cross traffic alert, Mazda Radar Cruise Control, Lane Keep Assist and Advanced Smart City Break Support. In addition, all models get alloy wheels of at least 7-inches in size, plus auto headlamps and wipers, power-folding mirrors, full-LED headlights and privacy glass. Inside, there's an MZD-Connect infotainment system with an 8-inch screen and a multimedia commander, via which you access integrated navigation, Bluetooth 'phone-linking, a DAB audio set-up and internet app integration. Plus there's dual-zone climate control, along with cruise control and a speed limiter. The 'SE-L LUX Nav+' grade further adds leather upholstery, heat for power-adjustable seats and steering wheel and a reversing camera. The fourth generation Mazda6 is a very good product in the medium range estate segment, especially in Tourer estate form. The problem for the Japanese brand is though, that it now competes against some other particularly good estates in this class. It needed a bit extra to stand out. Will the redesign we've been looking at here be enough to enable it to do that? Much of the answer to that depends on how Mazda promotes this car. Right now it's a bit of a forgotten choice in its sector but in our view, it doesn't deserve to be. Over to you.